A new report, commissioned by the CSRD and conducted independently by Neilson Strategies, formed the basis of the Board's decision on February 21, 2019 to unanimously support making a request to the Province to fund a study examining the potential creation of a new municipality, which would include the communities of Blind Bay and Sorrento. At the same Regular Meeting, Directors also affirmed a desire for change to the future composition of Electoral Area C. The motion informs the provincial Ministry of Municipal Affairs that if the Sorrento/Blind Bay incorporation process is not deemed feasible, the Board would then support the division of Electoral Area C into two separate Electoral Areas. A number of factors were considered when determining the best option including: geographical boundaries, current government services, population density, future development potential, road networks, property assessments and agricultural land. The option which best met the criteria for consideration for further study by the Ministry of Municipal Affairs was the formation of one municipality comprised of both Sorrento and Blind Bay. This would remove those areas from Electoral Area C, reducing the population served by one elected Regional District Director. Currently, Electoral Area C is the most populous region of the CSRD. The report notes that based on Census 2016 data, the estimated population for the potential incorporation area is 4,700, comparable with many municipalities in BC. This would leave Electoral Area C with a population of approximately 3,200. • division of Electoral Area C into two electoral areas, each with its own Electoral Area Director. For each of these scenarios, the Boundary Analysis is to recommend a study area — that is, a potential boundary. The recommendations are to be based on an assessment of quantitative and qualitative data, driven by a set of boundary criteria. For each scenario, the report identifies implications that would be explored further under a full restructure study. With the Board approval of the motion, the CSRD is now looking to the Ministry of Municipal Affairs to fund the in-depth study to determine the feasibility of this incorporation option and its potential costs to the taxpayer. A decision on incorporation would have to get the approval of the electorate through a referendum vote before any change could be made. The Area C Governance Study has now concluded. 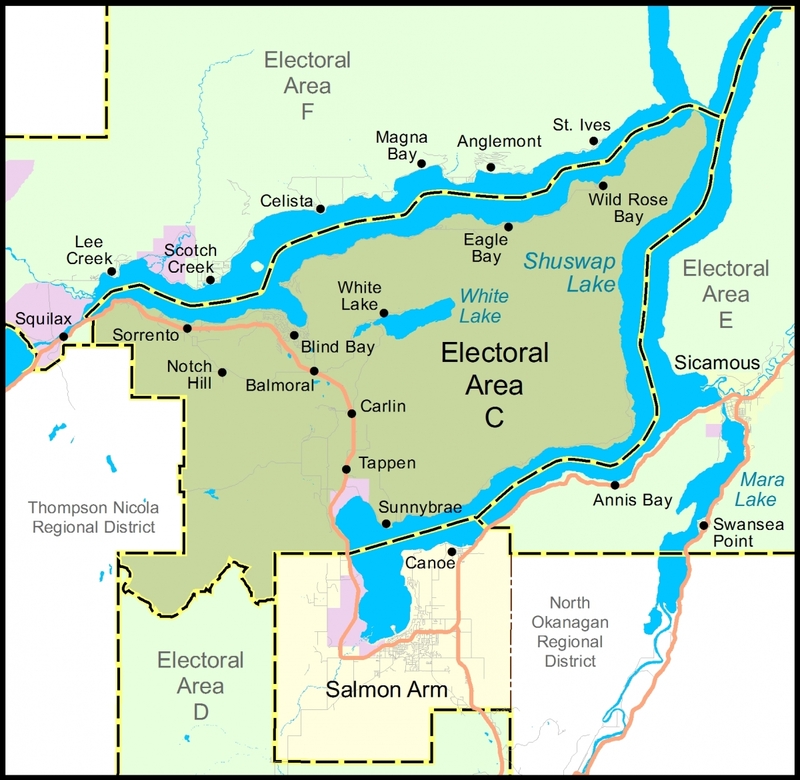 The Columbia Shuswap Regional District (CSRD) received Provincial Government funding for a Governance Study in Electoral Area C of our regional district in 2016. The governance study process was over one year in duration, involving a CSRD appointed Committee consisting of representatives from various communities within Area C, along with an extensive public community engagement process. Identify future governance and service delivery options for the Electoral Area. The Area C Governance Committee concluded in June, 2017 with a Final Report and a recommendation to the CSRD Board. The division of the current Electoral Area into two Electoral Areas. a determination of the exact boundaries for two Electoral Areas in Electoral Area C.
THAT: staff be directed to request a meeting with the Minister of Municipal Affairs and Housing at the 2017 UBCM Convention to provide an update on the Governance Study initiative and to request funding support to undertake a formal restructure study. For those that are interested, the information below pertains to the Area C Governance Study process that has now concluded. Do you live or own property in Sunnybrae, Tappen, White Lake, Blind Bay, Sorrento, Eagle Bay, Notch Hill or another Area C community? Have you ever wondered what services the regional district provides, how service decisions are made, or how you can express your views as decisions are made? The Area C Governance Study will answer these questions and offer opportunities for residents and owners throughout Area C to share their perspectives. What’s working? What’s not? What should be done differently? How do you feel about the current model for Area C? The study will explore the current structure of regional district governance and will reach out to Area C communities to understand their interests and concerns. The study will assess the need for change and will identify future options to improve the way Area C is governed and the way local services are delivered. The Final Area C Governance Study Report, including the outcomes of the study’s public involvement process, is expected to be presented to the CSRD Board of Directors in the fall of 2017. The first step in the process is to provide opportunities for Area C residents and property owners to learn more about their community and their current system of local government. The Electoral Area C Governance Study Overview – Getting to Know Area C, highlights important aspects of the local government system in British Columbia, and more specifically, local governance and service provision in Area C.
The Electoral Area C (South Shuswap) Governance Study Interim Report provides a comprehensive view of the overview content. Check the Document Centre below for other informative documents. There are many opportunities throughout the spring of 2017 to learn more and to share your views. Sign-up for email updates, attend an open house or a presentations in your community, or complete a study survey. To Complete a Survey! - Click Here.